People with missing teeth are more common than you think. From accidents to oral health deterioration, it is more than likely you know someone missing a tooth. Sometimes teeth are knocked out from an accident or other trauma but the leading cause of tooth lost in adults is periodontal disease. More than 17% of people in Michigan over the age of 65 have lost all their teeth. Missing teeth brings on the decline of oral health. The neighboring teeth wear down, break, reduce bone strength, and then the jaw recedes. Over time, your teeth misalign which causes a less youthful look and feel. A smile with missing teeth also makes people feel self-conscious. It also makes it difficult for people to bite and chew which drastically limits the foods they can choose from. Beyond adhesive dentures, partials or crown & bridge. Adhesive dentures, partial removable dentures and crown and bridge dentistry offer the results many patients appreciate and value. However, dental implants offer enhanced benefits and an outstanding level of satisfaction, comfort and confidence. Implants end embarrassment and oral health deterioration. Various forms of dentistry can provide positive restorative results. However, dental implants have many other valuable characteristics. Implants are lifelike and long-term. Adjacent teeth are protected – no need to attach a bridge or partial denture to them, making the procedure more conservative of your surrounding healthy teeth. Implant dentistry is comprehensive oral health rejuvenation with the added benefit of naturally beautiful smile makeover. It is dental care everyone with a missing tooth should consider, and then experience, if this treatment is right for you. Dental implants are quite effective. They are able to hold dental restorations in place securely as if they were natural tooth roots, and implant-supported dental restorations tend to look better than removable dental restorations. Other benefits of dental implants include the elimination of issues such gradual tooth misalignment, bone loss, and gum recession. While the first line of defense at Northwood Dental is preventive care and reversing any underlying oral health problems, Dr. Klym and our entire team is ready to restore our patients back to complete oral health. Whether you are missing one tooth, a few teeth, or have significant reconstructive needs, implant dentistry is a cost-effective and exceptional treatment option for you to consider. Dr. Brian Klym of Traverse City, Michigan provides his patients with single-tooth dental implants; multi-teeth implant treatment and implant-supported dentures. Dr. Klym has significant training in dental implants from oral surgery and placement to the creation of a lifelike esthetic restoration. Dr. Klym has completed the Misch Implant Institute Fellowship program and has been a Fellow of the ICOI since 1998. With Northwood Dental, implants are financially possible. While dental insurance will cover some or all the cost of an implant, an initial level of financial investment is required to achieve the goals of our reconstructive patients who have needs that are more significant. Yet, the ‘cost’ of the other dental treatments can be much higher especially when you consider the need for repetitive “redo” visits, and the hassles and frustrations associated with adhesive or removable dentures. The long-term savings in time and elimination of the aggravation means a better overall quality of life from mental stress to pocketbook pressures. Implant dentistry makes it possible to enjoy life’s little pleasures more as well as be consistently healthier throughout life. The cost of dental implants varies from patient to patient. A single missing tooth with a bridge is almost the same as replacing it with a crown and dental implant. Things like the number of implants, the type of replacement teeth, and the difficulty of the treatment affect the price per patient. Implants generally are in the range of $1000 to $4000 per implant. Before receiving dental implants, we will go over all treatment plans and payment options with you. There are many ways to pay for your dental implants. We accept all major credit cards and offer financing with approved credit through Wells Fargo and Care Credit. The cost of implant may seem out-of-reach for some but we offer financing options with approved credit. Financing is an option for those who need advanced treatment such as dental implant placement. Break the payments into monthly installments and you’ll be able to create a budget you can manage. Northwood Dental offers financing with approved credit through Wells Fargo and Care Credit. Northwood Dental accepts most insurance plans, and will maximize your benefit, and provide various financing options to help you make this investment a reality now. Please check with your insurance company to see if they cover implants. Our office coordinator can assist you with insurance claims and submitting insurance forms to get you all the allowable benefits. A few of the dental plans our office accepts: Delta Dental, DenteMax, and Blue Cross/Blue Shield of Michigan. 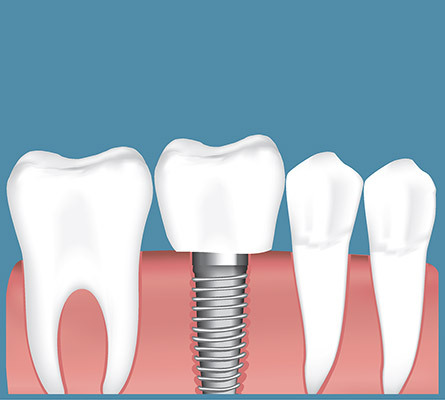 If you have lost a tooth or teeth and you are generally healthy, you could be right for an implant. An ideal candidate for implants has a healthy bone structure and gum tissue to support the implants. For those who have gum tissue and bone structure not strong enough to support implants, gum augmentation surgery is available to build tissue. There are alternative treatments to fit any need such as bone grafting surgery. Implants are like artificial roots that fuse to the jaw bone and gums. When these titanium posts fuse to your bone structure, the become strong enough to support a wide variety of dental restorations. Dental implants have a success rate of 95%. People with certain health conditions may not be able to receive implants. Also, young patients whose jawbones are developing are not eligible until they are older and finished developing. Even if you have been told you were not eligible for implants in the past, schedule an appointment, come in and get a consultation with Dr. Klym. His education, training, and experience with implants can work with you to give you the smile you can be proud of. Schedule a free implant consultation today!